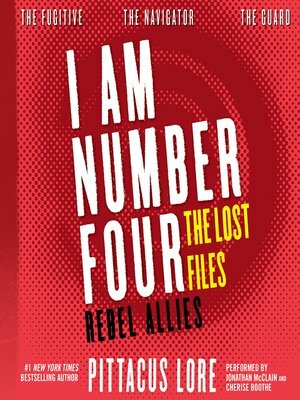 I Am Number Four: The Lost Files: Rebel Allies is the fourth collection of action-packed novellas from Pittacus Lore. Initially published separately as digital originals, these three stories are now together in one volume. Lost Files: #10: The Fugitive follows Mark James as he tries to track down Sarah Hart, evade the Mogadorians and the FBI, and discover the identity of the mysterious blogger he knows only as GUARD. Lost Files: #11: The Navigator reveals the truth about the crew of the two Loric spaceships who escaped to Earth and shows what happened to the pilots after they arrived and parted ways with the Garde. Lost Files: #12: The Guard tells the story of the hacker who has been aiding the Lorien survivors from the shadows for years. She's determined to defeat the Mogs—and she just found her secret weapon. You know the truth about the Mogadorians' invasion of Earth and the Garde who will do anything to defeat them—yet there is still so much to learn. The stories in Rebel Allies will help you get the answers you seek, but they will not help you stop the coming war. Only the Garde can save our planet. But they are not alone. . . .